The ACP-DXEL2-Pack is a cost-effective solution for a 2 Door Access Control System. This two door access control panel can connect up 4 Proximity card readers (one on each side of those 2 doors). If you do not require knowing when someone exits your building, you will only need a reader on the enrance side of the door and an exit button on the exiting side. You can wire this system up to your electronic door locks, such as magnetic locks and electronic door strikes. You will also be able to integrate with an alarm and sirens or strobes. 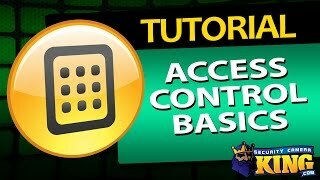 Accessing this 2 door access control panel is super easy. The control panel has an RJ45 port for you to attach an Ethernet Cable such as Cat5E or Cat6. The other end of the cable plugs into your network. Yes, it's that easy. Then, any PC that is on that network can access that control panel using our DX Access Control Software. You can specify and register users, configure access control proximity cards, create times that the door can be accessed and so much more. If at a later time you want to add more doors into your access control, we have made it easy for you to do that. 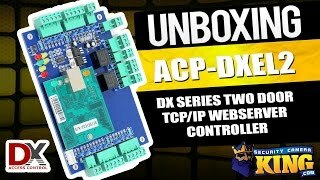 With our DX Series of Access Control Boards, you can connect several of the boards to your network and our DX Access Control Software will see them all. For example, if you buy this 2 door access control package and later on want to add a third door, all you need to do is get a 1 door access control board, connect that to the network and you will be able to control all three doors with the same software. An optional backup battery is highly recommended in case of a power outage and you can purchase that here. off line operation; real time supervision; photo display; mass storage; flexible user privilege setup; remote unlocking; multi-user supervision; quick setting; convenient checking and query; revisable and printable report form; report form;report can be exported to excel file; card+password unlocking; alarm for long time enclosing;alarm for invalid card swiping; first card unlocking;alarm for illegal break in; unlocking at definite time; e-map etc. for professional users such as bank,cash house, telecom station, power supply station,prison and police station: interface locking; intimidation alarm; integrated fire control;anti-passback and anti-tail; interlocking;multi-card unlocking; emergency double locking; in door population checking; unlocking based on internal and external validation. normal shift and multi-shifts time attendance management system; fixed ration dining management system; meeting attendance management system; Online patrol management system and security alarm management system. I have had this DX door controller installed in my 24 hour access gym for over a year now. I have been very satisfied with it performance. I installed it myself I have a lot of electrical experience. I found it pretty easy to install. The only complaint I have is that the software is not great as far as interface goes but, it does work without a hitch once you figure it out. I would recommend this system to anyone who wants to control access and keep track of who is coming and going and does not want to pay a monthly subscription to somebody like ADT.